We like to offer our customers the full boating experience – with so many boats to choose from we know how important making the right choice is for you. 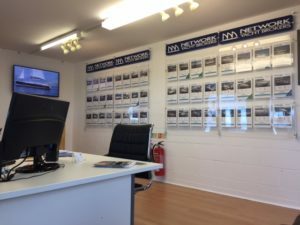 We offer comprehensive viewings where you will meet our friendly team members who can answer all your questions and queries. You will find the brokerage in the main marina ground floor fronted office. Conwy Marina has about 500 fully serviced Motor Boat and Sailboat pontoon berths operated by Quay Marinas Ltd.
We are part of the UK’s largest group of independent yacht brokers (Network Yacht Brokers) with offices throughout the UK and now Europe. The NYB group are specialists in the sale of used brokerage boats. NYB Conwy is the official Jeanneau Dealer for Sailboats, and Motor Boats for North Wales. Open 6 days a week, we are sure that we can find the ideal boat to meet all your needs at a price that offers exceptional value. Please feel free to contact us to discuss your boating requirements, or to make an appointment to view any of our boats – don’t hesitate to call, email or even drop by the office. We look forward to making your dream boat become a reality! What type of boat to buy? Before you start thinking about buying a brokerage boat, or indeed a second hand boat from anyone, getting to grips with the basic rules of engagement will help you make the right choice. A question we ask a lot of individuals who come into our office in Conwy is this. What do you want your boat to do? Is it for staying on over weekends, fishing, sailing? Or perhaps it’s a place to live permanently because you have decided to get out of the rat race? Whatever the reason for getting into boating you should have a good idea of your aims before you start looking for a boat. The next question is usually one of budget. So many times, people put themselves off by looking at boats they simply cannot afford. It’s great to visit boat shows and make a beeline for the biggest and best boat at the show. If you’re seriously looking to buy a boat show is not a good strategy. Our advice would be if you know you’re only dreaming then keep on dreaming and enjoy boat shows for what they are. If you are at the stage where you could buy a boat (new or old) then set a budget as this will help you keep things in perspective. It will also stop you looking at boats you simply cannot afford, after which you would not consider getting a smaller boat or yacht. Having eliminated boats you cannot afford, and assuming you have been to a couple of boat shows, the best place to find a new boat would be at a Yacht Brokerage. Hopefully this will help you understand the advantage of using a Yacht Broker rather than just trawling the small ads on the internet and buying something that you wish you hadn’t. A professional Yacht Broker will be associated to others as we are in Network Yacht Brokers group. We are individual companies who link resources in order to find and sell boats. We meet once a quarter face to face around a table and discuss the industry, set our marketing budgets and settle any disputes. The alternative to using a yacht broker is you can use the services of the internet. Some private individuals sell boats on the internet and quite successfully. However, we are hearing more stories of nightmare situations where buyers have sent deposits only to be gazumped by another buyer who offered a private owner a few pounds more. Even worse we have recently had several individuals report having sent deposits and lost them because of a well thought through scam. Obviously, we would say you should use a yacht brokers to buy your vessel. However, this service is free to the buyer, we cannot see why one would not employ a broker to conduct the purchase. Some brokers including us will for a nominal fee act as broker on private sales where a boat is not listed with the broker, so the purchaser pays for the service. The broker will draw up contracts and inspect title paperwork guiding a buyer through the process of purchase. So, if you see a boat or yacht for sale and want a broker to handle it don’t be afraid to ask for assistance. When you have found your dream boat or yacht one could be tempted to go ahead and pay the money and take a chance. Boats however are not like cars; few are worn out and sellers often use the ploy of insisting the boat hasn’t been used and so it’s just as good as when they bought it. Most owners believe this to be how it is. The fact is that could not be further from the truth. It’s possible to take a boat out of the water and put it into long term winter storage but most sellers simply give up on a boat by the time they get around to selling it or haven’t been able to afford the upkeep. Using a qualified and YBDSA registered Marina Surveyor will add a little more cost to the buying price of your boat or yacht. However, use a surveyor and you will have peace of mind that if the surveyor misses something he will have insurance. This insurance covers the unlikely event that you have problems shortly after buying your boat. For boats or yachts with a value of over £25,000.00 that started life in the UK having the correct paperwork is becoming essential. As yacht brokers we spend a lot of time chasing around finding paperwork for owners who want to get finance on their boat. It’s virtually impossible to get finance on a boat or yacht that hasn’t got the following paperwork. MCA bill of sale from each owner following on from the builder’s certificate. It being perfectly acceptable that the bill of sale has only one pound and all other considerations on it as this document is a title transfer and not a statement of value. V.A.T. invoice to the first end user. Where documents are not correct it is possible in some cases to obtain declarations but it’s not ideal. Please ask for information from the Yacht Broker. If you have everything in place, then the purchase can go ahead. However, buying a used boat or yacht can be a minefield. The most important being the law surrounding a private purchase – Remember if your buying from an individual its ‘buyer beware’.